Stephen Brotherstone and Dave Lawrence have written one of the most fascinating books I’ve heard about in ages. I’ve been following them on Twitter, and as soon as they shared the Lulu link there, I was typing in my billing information. It’s called Scarred for Life, and the first volume covers the strange and disturbing pop culture of the 1970s in a mammoth 740-page volume. Click the image above to order your copy. 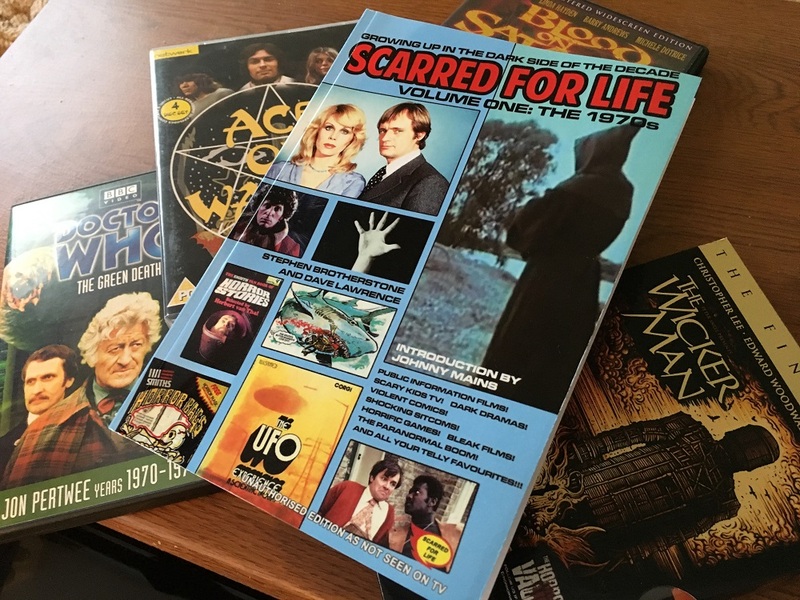 But here’s what I’m afraid might sway American readers from trying this: about the first half of the book covers 47 television series made in the 1970s, and by far most of these programs were never shown in the US. But please don’t let that give you too much pause: many of these series are very entertaining, and are spotlighted here with really fun essays that should have you browsing Amazon UK and getting a new external hard drive to play British DVDs. The writing is exceptionally good. I actually finished watching The Owl Service just a few weeks ago and didn’t really enjoy it much, but the essay here gave me lots to consider and think about. So what qualifies a show for inclusion for this book? It looks at shows that were just a little unsettling, pretty odd, or downright scary, starting with drama aimed at kids and working through the bleak and disturbing urban grime of Callan and The Sweeney to the dystopian worries of Doomwatch and Survivors, with asides into sci-fi from UFO to Sapphire & Steel. Since Doctor Who has been covered at very great length by many writers already, this gets a very brief overview, with the emphasis on strange merchandising and exhibitions rather than the storylines. Since the authors have more than 340 pages to play with as they discuss all of these programs, they can go deep and they can go on tangents. There’s a remarkable story about how the title sequence to an anthology series called Shadows left one of the authors in terror, and there’s more background about some fascinating serials made by the independent HTV company than I’ve ever read before. It’s got me thinking that I may need to pick up a 1975 serial called Sky to watch when this blog’s favorite five year-old critic is a couple of years older. Even if the programs are unfamiliar, it’s all fascinating, and should leave any reader curious, even if it’s a show they’d never heard of previously. That said, I do feel it would be a more rounded book if it had a little more of an international focus. Our experiences here on the blog with Land of the Lost prove that it would have been a superb inclusion in a roundup of TV that scared the daylights out of children, never mind Night Gallery or, especially when we reach the book’s critical second half, In Search Of. After the television section, there are a hundred pages looking over the UK’s old Public Information Films. I had an idea what these were from a very odd joke in an episode of The Young Ones (“Think once, think twice, think don’t drive your car on the pavement!”), but otherwise had no experience with them. YouTube has shown me that we didn’t miss too much here. But then, well, things get amazing. If the first half of the book is fascinating but of limited interest to American readers who have not yet seen or heard of these programs, then the second half is so completely essential that you can file the television material as a lengthy prologue. This is the main course, and it’s amazing. See, the seventies was when horror invaded suburbia through paranormal activity and gore and ventriloquist dummies, and this book looks at everything, from scary board games to Bigfoot to shocking, gut-punching, controversial films like Soldier Blue and Straw Dogs. It goes from that game where you extracted plastic flotsam from a shark’s mouth to the “folk horror” trio of movies, Witchfinder General, The Blood on Satan’s Claw, and The Wicker Man. Anybody could just kick up some nostalgia by listing a bunch of old scary movies, but the quality of the writing is so good and so amusing that it succeeds brilliantly. I particularly loved reading a childhood perspective on Ridley Scott’s Alien from the point of view of somebody who could read about the production, and see all the merchandising, but couldn’t actually go to a theater to watch it because he was too young. Then, several pages later, he gets to see something that’s apparently child-friendly, Watership Down, only to find the most traumatizing experience of anybody’s childhood. We spend about seventy pages on comics, and again, many of these may be unfamiliar to American readers, but if you haven’t yet experienced the joys of Hookjaw or the hideous-killing-every-week of Death Planet or the cruelty of all those girls’ comics about nasty stepmothers who hate long hair and ballet, you’re in for an incredible treat. The downright freaky Marvel titles of the decade get a satisfying overview, although Brotherstone admits he could have gone even deeper into author Steve Gerber’s entertaining bibliography. Marvel’s Tomb of Dracula and Adam Warlock, among others, are discussed in context and even comic fans familiar with this material are certain to find new things to consider here. Finally, there’s a mammoth section about the seventies’ obsession with ghosts and aliens. A couple of American TV shows get a mention in this big chunk of the book, which kicks off with Chariots of the Gods? and worms its way through ancient astronauts, UFO coloring books, Bermuda Triangle-inspired television, Elton John songs, Close Encounters, Amityville, and, of course, the Loch Ness Monster. This is just fantastically fun. You may have forgotten just how much of the decade’s popular culture was informed by psychic powers, Nazca lines, and the paranormal, but you won’t forget in a hurry after reading this. To sum up, this is a hugely entertaining and incredibly dense labor of love that will certainly keep anybody entertained as they spend the weeks necessary to read and absorb the thing. I am enjoying it tremendously and am looking forward to the second volume, which will look at the following decade and promises to be equally thrilling. Click that image up top and order your copy today!